"Top right: The second character in the four does not make sense in Japanese, but other three do: Water-X-Four-Seasons. It seems it is part of a series of 4 seasons of water. It is Summer and Rain (the two characters below the first four). 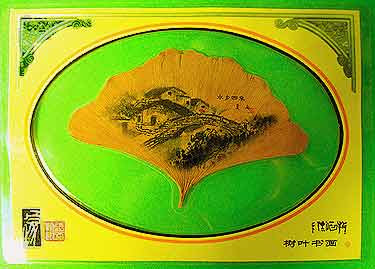 Bottom right: The real bottom one is the name of the painter: The first character is his/her Family name and it probably means tree, but abbreviated in post-revolutionary Chinese way, which is different from Japanese. Second and third are his/her given name. The second in Japanese means "wish fulfilled ." The third is again a post-revolutionary abbreviation and I do not know the meaning. The fourth means "Painted/Picture" indicating the person with the name of the three characters painted/drew this. The vertical 4 small characters and the horizontal 3 characters are not the same as the painter's name and written in more ancient, stylized characters and are difficult to decipher. Bottom left: They seem to be the stamps of either artist or publisher, but I cannot decipher. The top two characters in the red stamps are (from the right) "to stretch" and "to obey" and the bottom left is similar to "silver."